On Sunday, Oct. 28, last year, the Dodgers lost the fifth and final game of the World Series to the Boston Red Sox. 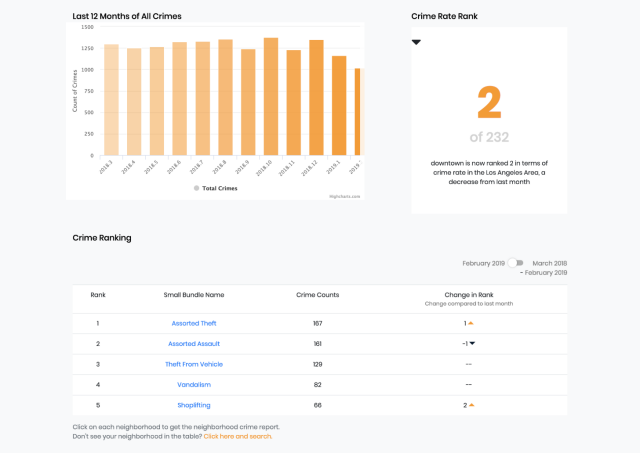 That same day, the Los Angeles Police Department filed 78 reports of domestic violence, the highest number for the month and the third highest single-day total for the year. On Sunday three weeks later, Nov. 18, there were 43 reports filed. The pattern of higher-than-average reports on game days holds for the entire period of the World Series. From Oct. 23 to Oct. 28 there were a total of 308 domestic violence crime reports in Los Angeles, and a total of three World Series games played at Dodger Stadium. 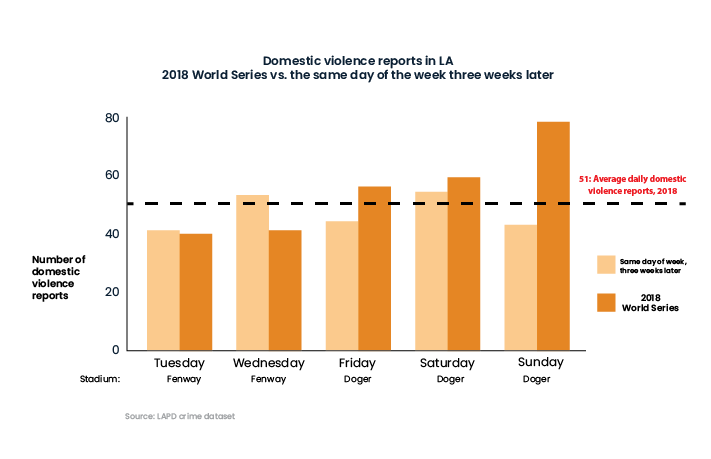 Days on which World Series games were played averaged seven more reports, an increase of 11%, when compared with the same days of the week three weeks later. We chose the period three weeks after the World Series as a basis of comparison that would not be impacted by the baseball season. During the first two game days, there were actually fewer reports when compared against the same days of the week three weeks later. But incidents of domestic violence reported to the police mounted steadily throughout the series as the Dodgers’ fortunes worsened. Oct. 25, when no game was played, saw 34 reports – the fewest of any day during that period. An average day in 2018 registered about 51 cases of domestic violence reported to the LAPD. In 2017, the daily average was 54 reports. The increase raises a troubling question: Do big games impact reports of domestic violence? Our data is limited to LAPD reports. 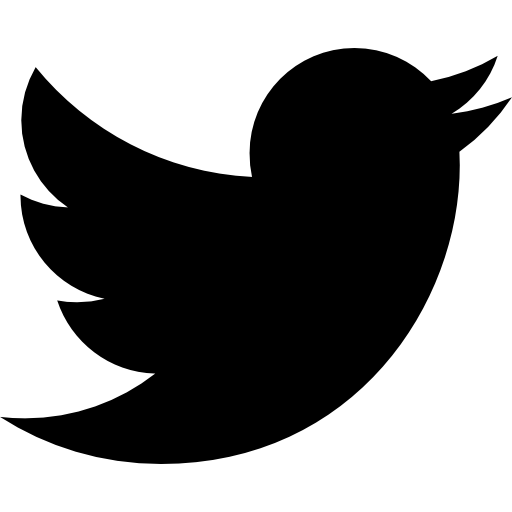 However, studies in other areas have found a connection. In nations such as Colombia and Costa Rica, domestic violence has been shown to increase during major sports events, such as the FIFA World Cup. Researchers at Lancaster University in the United Kingdom published a study in 2013 noting that over three World Cup tournaments, police reports of domestic abuse in Lancaster, England, rose 38% when the national team lost and 26% when it won. 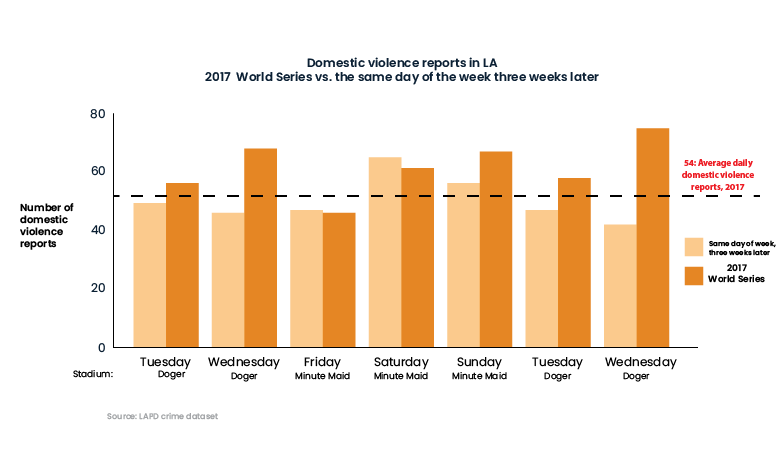 During the 2017 World Series, when the Dodgers fell to the Houston Astros, there was also a spike in the number of domestic violence reports during the seven game days. Days on which games were played had an average of 11 more reports in the City of Los Angeles, an increase of 23%, when compared with the same day of the week three weeks later. LAPD officials acknowledged that overall crime tends to increase on days when sporting events occur. They did not specifically examine a connection between sporting events and domestic violence incidents. Linda Offray, the executive director of Pasadena, Calif.-based Shepherd’s Door Domestic Violence Resource Center, said sporting events can can provide an additional spark for domestic violence, but the sporting event itself is not the cause. Offray said she was “totally unsurprised by the [Crosstown] stats” based on the number of individuals who mention sports when seeking help at her non-profit. 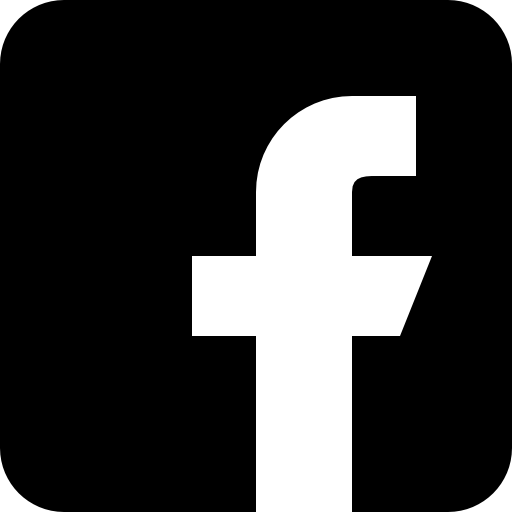 She also cited the Lancaster study and a University of Calgary study on domestic violence as evidence for the connection between high-intensity games inciting violence. Both Offray and the LAPD encourage victims of domestic violence to report incidents and seek help. The LAPD lists emergency numbers here, including Los Angeles-based shelters and agencies. 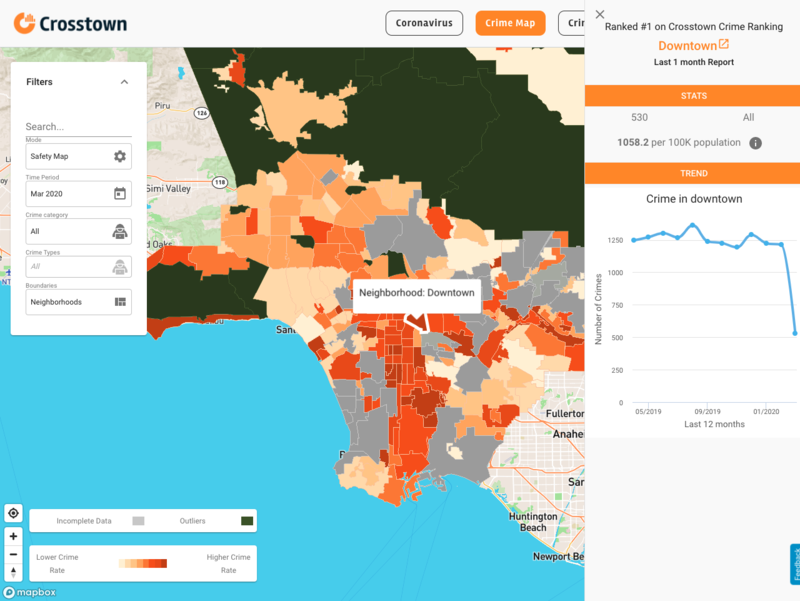 How we did it: We looked at LAPD publicly available data on domestic violence. 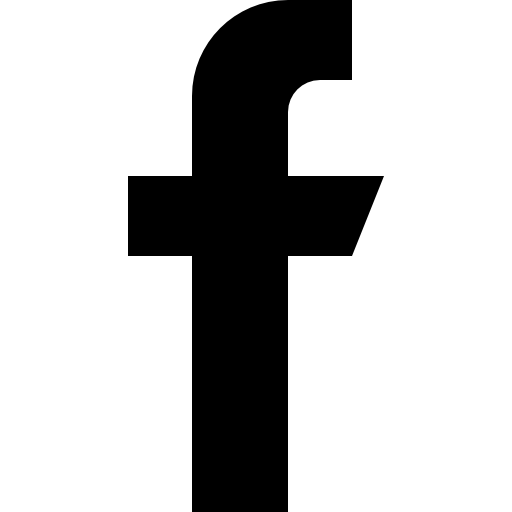 Learn more about our data here.